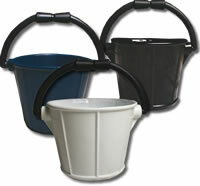 What is there to say about a bucket? Well, if it’s this bucket, quite a lot. For a start it’s unique in that it is made from 100% PVC which is flexible. The hard wearing material has a slight ‘give’ to it that makes it very strong but also rigid enough to carry a full amount of water. With no metal parts at all there is no danger of any damage to your boat from scraping or accidental bashing. The bucket is available in white, black or navy colours that will not mark your deck. It’s even got a handle! In short, it’s all the bucket you will ever need. very strong and hard wearing.